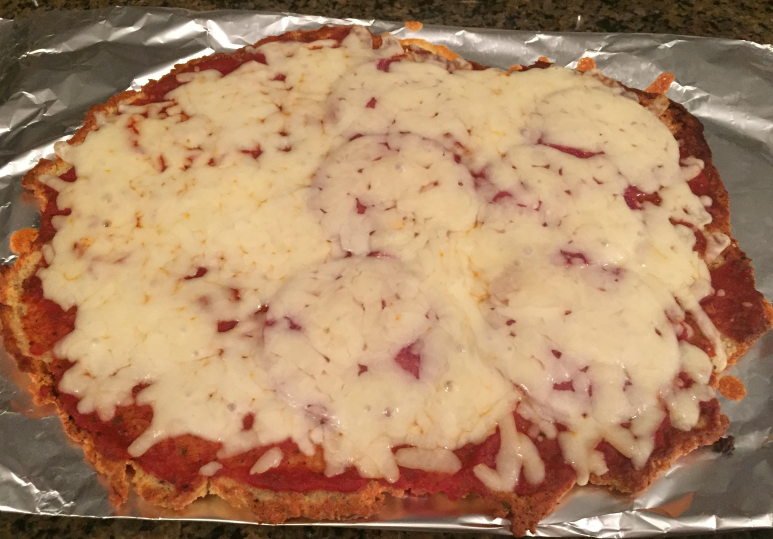 This Keto friendly pizza is better then the real thing! We are now on Day 26 of our Ketogenic Diet. We have made quiet a few yummy recipes with "Keto Friendly" foods! We wanted to share one of our favourite recipes which is a Low Carb/Keto Friendly Pizza. It tastes way more yummy then the tradiontal "high carb pizzas!!" Give it a try and let us know what you think. 1. Preheat oven to 400F. Measure out 2 cups of Mozzarella Cheese and place it in a microwavable bowl. 2. Melt the cheese until fully melted. Try not to brown it as it will go hard. We microwaved it for about 2 mins and kept checking on it so it didnt brown. 3. Then after its melted and pliable add 1 Egg and the 3 Tbsp of Cream Cheese and mix well. 4. Now add the 3/4 cup of Almond Flour, 1 Tbsp of psyllium husk powder, 1 Tbsp of Italian Seasoning and the Salt and Pepper to the cheese mixture and mix it well. 5. As you mix the dough it will become cool enough to mix with your hands.Then kneed the dough together until it forms a ball. 6. Next plop the ball on to a baking sheet or pizza pan greased with oilive oil. It WILL stick so make sure to grease it.Then press the dough with your hands forming either a circle or a rectangle. 8. Remove the pizza from the oven and top with the Tomato Sauce, Pepperoni and Mozzarella cheese. Place it back in the oven just long enough to melt the cheese. We cut it into 9 square pieces to lower the calories per slice.